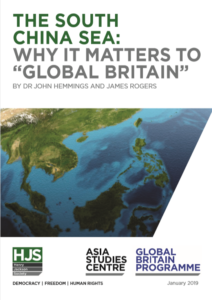 In this Policy Paper, Dr. John Hemmings and James Rogers look at the geopolitical significance of the South China Sea to the United Kingdom. On 31st August 2018, HMS Albion, one of the Royal Navy’s amphibious assault ships, passed through the Paracel Islands in the South China Sea. The People’s Republic of China (PRC) immediately informed its crew that they had strayed into Chinese sovereign territory, while sending naval and air assets to interdict the British warship. This was the first known British attempt at a modern “Freedom of Navigation Operation” in the South China Sea. The two experts identify five key reasons as to why the South China Sea matters to British interests, before moving on to focus on the PRC’s revisionist activity there, which threatens to dislocate the Law of the Sea and disrupt the wider rules-based international order. The Policy Paper concludes by asking if the time is ripe for the UK and the Royal Navy to adopt a more formal and transparent Freedom of Navigation Policy to help uphold the Law of the Sea and dissuade revisionists from hostile, illegal and/or excessive activities. As such, this Policy Paper proposes that the Royal Navy is not only bolstered to meet the growing challenge from the PRC and other revisionist states, but also that it maintains a persistent, if not permanent, naval presence in the Indo-Pacific region, and Southeast Asia and the South China Sea in particular. The China seas are an area of vital national interest to the United Kingdom, trumping inward Chinese investment and diplomatic niceties as a priority. Whilst many scholars have long admired the problem, in this report Dr John Hemmings and James Rogers explain not only the “why” but also “how” and what the British government should be doing about it. Dr John Hemmings and James Rogers make the case that the South China Sea issue has implications for British national interests. They conduct an assessment of HMS Albion’s Freedom of Navigation manoeuvre last summer in the context of “take notice, take action”. I am hopeful others will follow the example set by both authors and expand on this research and awaken Europeans to their strategic interests, which are being challenged by the People’s Republic of China’s actions. The issues raised in this Policy Paper are of considerable importance for global security and our maritime nation in particular. The illegal activity of the People’s Republic of China in the South China Sea is increasingly dangerous and should not be ignored. I support the conclusions of a need for an increased British naval presence in the region and for additional actions in support of Freedom of Navigation. Despite its nature as a Universal Principle, free use of international waters in the South and East China Seas has failed for decades to attract the close attention of Europe. However, John Hemmings and James Rogers have made a crystal clear case that the UK should conduct FONOPs in line with the US, Japan, and other regional states. Their recommendations for a new initiative for the UK, already partially realised, would help counter China’s wilful, destabilising actions in the areas. Is not the South China Sea too far away for the UK to worry about? In an increasingly globalised, interconnected and contested international environment, maritime communication lines matter like never before. In the South China Sea, the People’s Republic of China is seeking to revise the Law of the Sea by asserting a number of unlawful and excessive claims over various international waters and low-tide elevations. This is important because the UK, a maritime trading power, relies on maritime communication lines, which in turn depend on the cohesion of the rules-based international system. Should not the UK focus on European security instead of the Indo-Pacific? European security and security in the Indo-Pacific are not mutually exclusive but increasingly interlinked. The UK must coax its European allies – particularly Germany, France, Italy and Spain – into doing more in Europe to uphold the continent’s defence, leaving the British freer to uphold the security of the most important European maritime communication line, i.e. the Royal Route from Suez to Shanghai. Would a British presence in the South China Sea not cost too much money? Maintaining a persistent naval presence in the Indo-Pacific – not least the South China Sea – comes at a cost. However, over twelve percent of British trade passes through the South China Sea each year, equivalent to £92 billion. The question is not whether the UK can afford such a persistent naval presence, but whether – given the quantity of trade involved it – can afford not to. Indeed, insofar as the Indo-Pacific is fast becoming the centre of the global economy, the UK must retain market access, and access to East and Southeast Asia can only be guaranteed via the sea.